The winners of the British Animation Awards 2014 were revealed at a ceremony held on Friday, March 7th at the BFI Southbank. The BAA’s recognise all forms of animation and reward the work of both new and established animators for short films, animated graphics for film and television, children’s series, music videos and adverts. Hosted by comedian Aisling Bea, the Awards saw the likes of Peppa Pig, Room on the Broom and The Amazing World of Gumball emerge victorious. 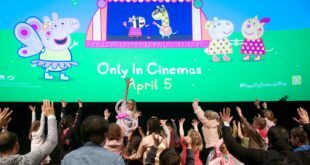 Comedy actress Morwenna Banks picked up the BAA for Best Vocal Performance in Ben & Holly’s Little Kingdom and Cartoon Network’s The Amazing World of Gumball won awards for Best Children’s Series and the children’s jury judged Children’s Choice Award. 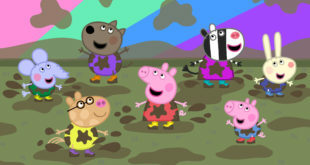 Elsewhere, Astley Baker Davies won the Best Pre-School series for Peppa Pig: Mr Bull in a China Shop, while Darrall Macqueen won Best Mixed Media children’s series for CBeebies show Baby Jake: Popping Peas. Magic Light Picture’s Oscar-nominated Room on the Broom picked up the BAA in the Long Form category beating the likes of Aardman Animations’ Pirates! On an Adventure with Scientists and Lupus Films’ The Snowman and the Snowdog. Best Music Video was won by Andrew Thomas Huang for Before Your Very Eyes and the Best Short Film award went to Mikey Please for Marilyn Myller. The 2014 Student Award was won by Middlesex University’s Antonio J Busto Algarin for The Day I Killed My Best Friend while Ainslie Henderson of Edinburgh College of Art won the Student Excellence Award for I am Tom Moody. In the commercial categories, Shay Hamias and Will Barras’ Mindfull won the APA 2D Commercial Award and Talk Talk: Model Britain, directed by Daniel Kleinman, was voted the APA Best 3D Commercial. RSPB: Vote for Nature, directed by Morgan Powell and Neil Kidney for Seed Animation, picked up the BAA for Best Commissioned Film. Elsewhere, Peter Candeland at Passion Films won the Best Film/TV Graphics for BBC Olympics: Stadium UK and Animate Projects and Lupus Films won the Best Motion Graphics award for the Channel 4 film Apocalypse Rhyme. In the Public Choice categories, Talk Talk: Model Britain tied with WWF: We Don’t Farm Like This for the title of Favourite Commercial, while Peter Baynton’s animation of Benjamin Scheuer’s The Lion won the Favourite Music Video. Elsewhere, Car Park and Buy Buy Baby, by Ant Blades at Birdbox Studios and Gervais Merryweather NFTS shared the award for Favourite Film. The BAA Sting Competition saw animators asked to create a special sting for the Awards, with the winners picked by a jury. The winners were Katie Single from University of the Creative Arts (UCA) Farnham and Jack David Evans from the University of South Wales for the Student Category and Anthony Farquhar Smith from Th1ng for the Professional Category. “We never ceased to be amazed by the astonishing strength and depth of the animation industry in this country and 2014 is no different," said BAA director Jayne Pilling.